My friends frequently ask me about the kind of research I do at Yahoo! Labs. Usually I cannot give them many details, because our work is confidential. But after a project is completed we frequently publish a paper describing it. This is a great opportunity for others, inside and outside the company, to learn more about our efforts. You can freely download the full PDF version of the paper. You can also search the publications repository, looking for papers about a specific subject. A few papers are more theoretic in nature, but most of them are very practical. For example, a recent publication that became very popular makes an analysis of user behavior at Twitter, and surprisingly concludes that “roughly 50% of tweets consumed are generated by just 20K elite users”. Of course this conclusion has some important implications for companies that want to advertise on Twitter. 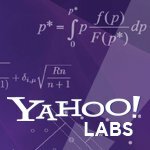 So good luck learning more about our research activities at Yahoo! Labs. I’m sure you will find some inspiring ideas. Enjoy! This entry was posted in Research, Yahoo! and tagged Research, Yahoo!. Bookmark the permalink.